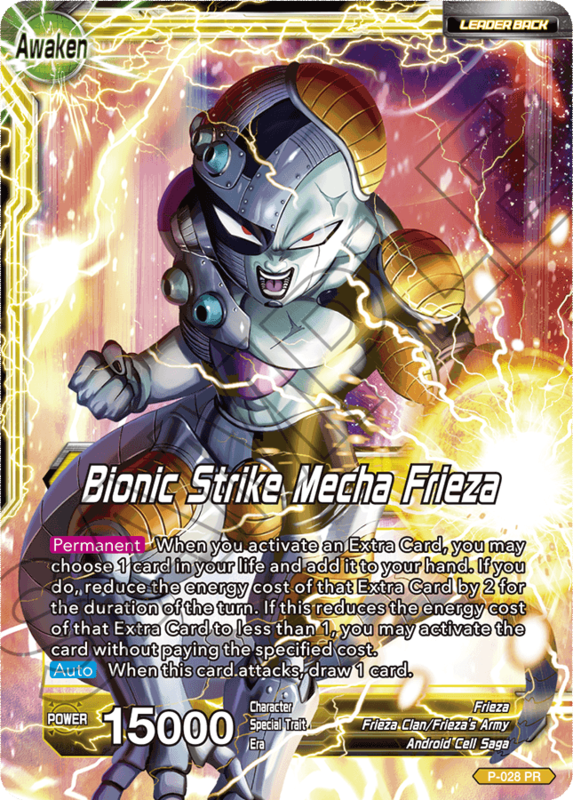 We’ve heard a fair amount of concern from parts of the player base about decks using P-028 Frieza/Bionic Strike Mecha Frieza to win on the second turn of the game. These decks use Bionic Strike Mecha Frieza to reduce the cost of Extra Cards while trading life for cards in hand. Then they play cards like BT3-003 Victorious Fist Super Saiyan 3 Son Goku, BT3-008 Fearless Pan, and BT3-123 Hyper Evolution Super Saiyan 4 Son Goku by turn two, attacking multiple times to win. Most of the messages we’ve received have expressed concern that this strategy is so fast that, unless you play a deck specifically designed to counter it, winning against it is nearly impossible. Players are rightfully concerned that this will result in a degenerate and unbalanced play environment. 1) Though the deck has an extremely strong strategy in turns 2-3, it has a hard time winning after that (particularly if its Battle Cards are removed). 2) There are several decks that do well against it. There are still other decks that can win in a tournament environment. *Counter strategies are described below. However, we also understand that the existence of a strategy that can win on turn two is discouraging to new players and those who aren’t aware of how to counter it. The act of adding a card to the Watch List itself does not mean that the card will be restricted in constructed gameplay or its skills will be changed, but we may issue errata to the card’s text based on how things play out. As we have in the past, we’ll continue to observe the state of the game, making adjustments as necessary to provide a fun and exciting play experience for both Dragon Ball fans and seasoned card game players alike. ① Decks that can defend against repeated attacks during turns 2-3. ② Decks that can remove large early threats like BT3-003 Victorious Fist Super Saiyan 3 Son Goku on turns 2-3. Here are two decks running the above strategies—a blue/green Cell deck, and a great ape deck. You can use the skills on Cell / Ultimate Lifeform Cell to eliminate your opponent’s Battle Cards, and blue cards like BT1-055 Whis’s Coercion and BT2-048 Group Leader Pilaf allow you to defend against your opponent’s onslaught during the early game. The deck’s defensive core consists of 12 blue cards, so you can choose to run them in the sideboard, bringing them in for game two to handle the Mecha Frieza matchup. BT1-110 Crusher Ball and BT3-104 Flying Nimbus help you to defend against repeated attacks, while the combo of BT3-100 Unwavering Solidarity Shugesh and BT3-088　Explosive Spirit Son Goku can eliminate your opponent’s larger Battle Cards and defend against attacks. Since the Bardock Leader Card switches your energy to Active Mode when awakening, you’re guaranteed to have enough energy to play the cards you need for defense, and BT3-096 Hidden Power Great Ape Tora can remove large Battle Cards at a low energy cost. These are but a few ways to deal with this deck archetype. We look forward to seeing the new deck concepts you come up with!